Will they ever sell life sized keyblades? Recently, we have seen a huge spike in merchandise for the franchise as 2018 slowly winds down to the release of the long awaited KH3. This has spawned a resurgence in POP! figures, diamondselecttoys, posters, and other items related to the beloved franchise. However, they have yet to release life size weapons from the franchise, like the numerous keyblades that have graced the hands of the wielders. It's not to say they HAVEN'T, i remember this site forewarned me of a japanese kingdom key that can use the sound effects heard when using magic, and even project a keyhole on a wall. Then there were the Destiny's embrace and kingdom key for the Kairi and Sora costumes. Now while that is nice step in the right direction, more often than not it's always the Kingdom key, which i can understand, it's the most iconic weapon in the game, appearing in almost every game. But when it boils down to it, wouldn't it make sense for more variety? I know we're a relatively small fanbase compared to other games, but we've got Disney movie characters in our games. 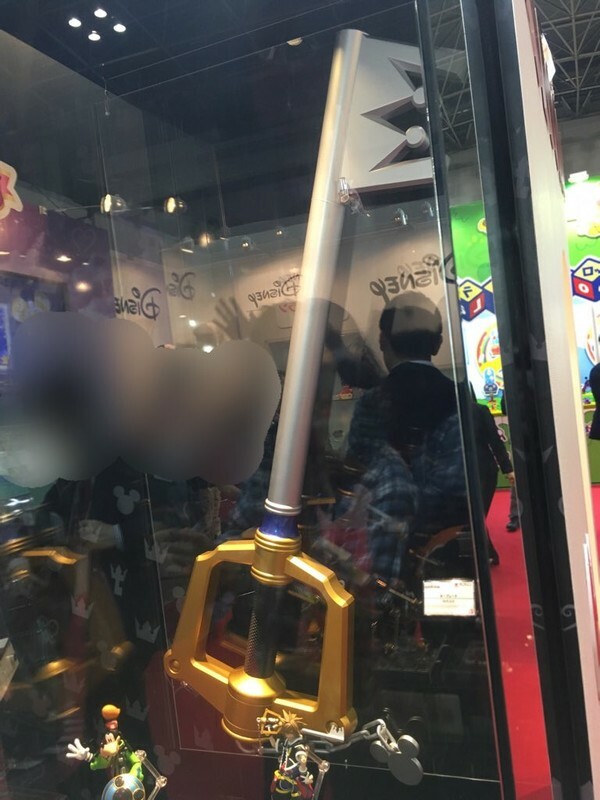 If they released most of the world keyblades of the first game like the Ladyluck, three wishes, olympia don't you think some of the fans of those movies would want to purchase something linked to that movie. Likewise, fans of both Kingdom Hearts and Final Fantasy would appreciate weapons like Fenrir, Lionheart and the One-Winged-Angel if they favored the weapons of their iconic wielders. And of course, who could forget the Ultima Weapons that have always bestowed an unbeatable balance of attack and magic while looking as elegant as possible. I know the easy argument is "Well it's a Kids game! do you really want children running around with weapons that can do severe harm to themselves/others" but that's not necessarily true. Sure, over in the states the original was rated E for everyone, but as the games kept coming they began to have a 10+ age rating (which considering some of the confusing plot elements and certain scenes, i can understand). In addition, it's not like other franchises marketed towards children haven't gone the weapon route, look at power rangers and some of their weapons. I know it might be the cost that deters the marketing, but look at some of the play arts Kai figures, wonderfully made but at the cost of being worth hundreds of dollars. In the end, it's a tough call whether people would want this or not. There are cosplay keyblades on ebay and sites like that, but some of them have quite the hefty price tag (Ebay especially, some guy is selling all 4 metal versions of the Ultima weapon for 800 USD). I'll leave a poll above even if it changes nothing. Even if we don't get every Keyblade, it'd be cool to see cheaper versions of the Keyblade and it'd be a nice alternative to the cosplay Keyblades or the proplica one. Only a Kingdom Key replica has officially been made. Here is KHinsider's article on it. It will run you $150. Sigh... It's always the kingdom key, and at a price tag of 150 smackeroons that's not bad, (compared to 800 dollars for the ultima weapons) Don't get me wrong, it looks nice, but is this all the series will be known for? The Kingdom Key is the most iconic Keyblade so of course the first officially licensed Keyblade would be of that one. Perhaps if the Proplica sells well they might make some other ones, but given the intricacy of the Ultima Weapon designs, I don't imagine them being made in the same manner as the image above. Too many tiny parts to break, too expensive to craft properly. Oathkeeper and Oblivion are almost as iconic as Kingdom Key, so those are prime candidates for getting replicas. Kingdom Key D is always easy to produce because they just have to palette swap their existing KK build.